bad mom: all you need is love. and chocolate. and wine. all you need is love. and chocolate. and wine. I got this gem from Karen at For the Love of Pete. It is a delight to have someone like you, and I enjoy Karen's blog because 1) it has a very cute cartoon version of her in the banner (even if she does have a crazy Mac laptop) and 2) she has a terrific girlfriend/neighbor voice that comes through in all of her posts; I wish I could pop over to her house for a cocktail every afternoon once in awhile. 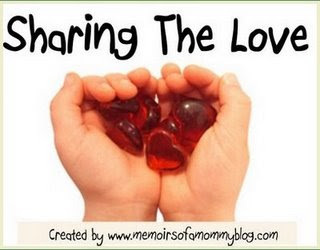 Rules of the award: SHARE THE LOVE!!! Lisa at Mama Milton ~ She is a real-life best friend with wonderful kids the same age as mine and a temperament to calm the most ferocious PTA harpy drunken neighbor individual one might encounter. Plus she's hilarious and is willing to watch movies with unhappy endings. Jimmie at Short Bus to Hell ~ Another real-life friend whom I've known since the Dark Ages college, with a wonderful [hot] partner and delightfully prissy dog. He is also hilarious (except when making fun of my age and/or my status as a Breeder), though prone to watching very gay movies. Moxy Jane at Spiral Bound ~ A Texan (how could that possibly be a bad thing? Wait, don't answer...), a super smartypants in the best possible way, a brilliant photographer with a sharp eye and equally sharp tongue. LarryG at Yesterday, Today, Forever ~ This dude leaves the most thoughtful comments, writes lovely & insightful poetry, takes remarkable photos, AND rides a Harley. While parenting. That's talent, people. So there you go; that's a third of all you need. Well, of course, Lisa is the best! I'm excited about checking out the other blogs. why gee whiz... as someone once said "i'm a legend in my own mind"
i've also got a blue ox and was raised by wolves... :) hmmm wait a minute!!! Thanks Stephanie! And congrats on winning another award. Well, gawsh y'all, this here award has me all smooshy inside!! Thank you, Stephanie! I do feel the love, and I mean that. Congrats on your award, and I'm off to visit the people you mentioned... except Moxy Jane, since I already visited her today ... she IS wonderful!